Korea style travel bag Travel bag manufacturer More than 1000 styles of travel bag optional 360&deg; trolley systems Bag OEM Customized Korea style travel bag Business type: Manufacturer, welcome to visit our factory; Main Markets: USA , Europe, Japan, Canada, Australia, Middle East, Russia, South America, etc. Main Material of Travel bag : Genuine Leather, PU, nylon, polyester, PC, ABS, PVC, PP , aluminum, canvas and so on; Size of Travel bag : 15,16,17,18,19,20,21,22,23,24,25,26,27,28,29,30,31,32 inch, optional; Lining of Travel bag : Nylon or Polyester 70D, 150D, 190D, 210D, 420D etc. Trolley systems of Travel bag : Systems: build in, or 360 degree wheel systems, optional ; Handle: aluminum alloy, iron, optional; Wheels: iron, stainless steel, zinc alloy, aluminum alloy + Rubber, PP, optional; Zipper systems of Travel bag : Zipper&rsquo;s Material: Nylon, Polyester, Iron, and Copper optional; Zipper&rsquo;s size: 3#, 5#, 8#, 10#, optional; Lock with password: optional; Color of Travel bag : Black, white, red, pink, orange, blue, green, yellow, silver, purple, brown, or other optional; Printing of Travel bag : Sublimation, silk screen printing, hot stamping etc. 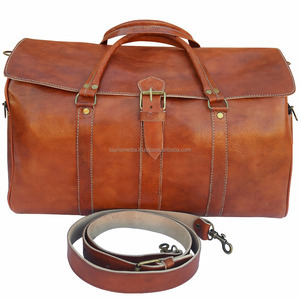 Wholesaler of handmade moroccan leather travel bags, duffle bags, weekender bags made out of genuine hand tanned premium leather Size: 56cm x 30cm x 33cm Adjustable and detachable strap You can customise your travels bags with different design and colours. Feel free to contact us for all informations you need. We are also engaged in manufacturing a wide variety of luxury goods embossed in either ostrich or shagreen leather. Our products are available in many natural colors and decorated in eye-catching designs and patterns. We are confident that you will find our goods both excellent in quality and reasonable in price. 2. With over 200 works, we can satisfy our customers the shortest delivery time at good quality. 4. Our authorized customers come from most countries all over the world, such as North America, Europe, Europe, Asia etc. 6. With a design department over 6 persons, we can offer our customers the best OEM&ODM service. 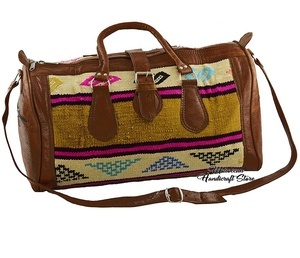 Wholesale of handmade leather kilim travel weekender duffle bags made in Morocco. Size: ~45cm x ~34cm x ~24cm Type of leather : Genuine & hand tanned premium quality cow leather Adjustable and detachable strap You can customise your travels bags with different design and colours. Feel free to contact us for all informations you need. We are also engaged in manufacturing a wide variety of luxury goods embossed in either ostrich or shagreen leather. Our products are available in many natural colors and decorated in eye-catching designs and patterns. A vintage travel bag for both men and women, made of 100% natural genuine leather, carefully and lovingly handmade by our talented craftsmen. This fine Moroccan duffle leather bag handcrafted by a one of our team of artisans from the Premium quality of Cow Leather in Marrakech, Morocco. Everything is handmade in our workshop including dyeing the leather, cutting the patterns, gluing the pieces, sewing and polishing or oiling the item. Detailed Images Packing & Delivery Packaging Details: Plastic and box. 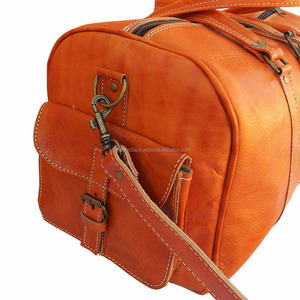 Alibaba.com offers 351 moroccan leather travel bag products. About 47% of these are travel bags, 15% are handbags, and 1% are blanket. A wide variety of moroccan leather travel bag options are available to you, such as genuine leather, abs, and pvc. 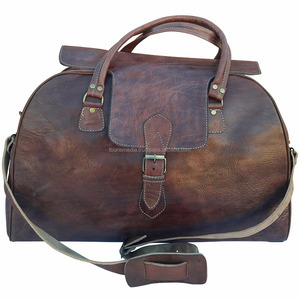 There are 270 moroccan leather travel bag suppliers, mainly located in Africa. The top supplying countries are Morocco, China (Mainland), and United States, which supply 63%, 24%, and 8% of moroccan leather travel bag respectively. 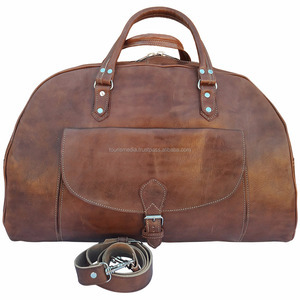 Moroccan leather travel bag products are most popular in North America, Northern Europe, and Oceania. You can ensure product safety by selecting from certified suppliers, including 3 with ISO9001, 2 with SA8000 certification.